What happens around Australia when the sun goes down? Little animals come out to play of course. Teach your own little critter to count to ten, with baby native animals running, hopping, swimming, eating and playing from dusk to dawn. First the Wilderness Society Award and now this enchanting new book! Congrats again Renee! 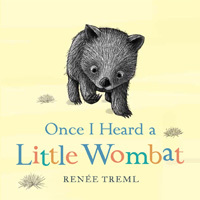 Renee's Once I Heard a Little Wombat shared the award with Danny Snell's The Seagull. Once I Heard a Little Wombat is published by Penguin Random House as a board book, for ages Pre-K. The Award encourages children to take an interest in nature and feel a sense of responsibility for the places we love, and our unique wildlife. Once I Heard a Little Wombat is an Australian take on a classic nursery rhyme that introduces several unique native animals to the littlest of readers. Fantastic - congrats again Renee! Here is another SCBWI Success Story—this time involving the Illustrator Showcase and the fabulous illustrator Renee Treml! "At the 2014 Conference, I displayed my illustrations at the Portfolio Showcase. A few weeks later I was contacted by Tiffany Malins of Scholastic Australia to illustrate a new Father’s Day Book, Daddy, You’re Awesome! It was the first book I illustrated that I didn’t also write and it was a fantastic experience. The team at Scholastic were very supportive and encouraging. This book led to a second project illustrating Jess Black’s Moon Dance (Scholastic 2015)."